KABUL: The UN Secretary General’s special representative has voiced his concern at security and political challenges to Afghanistan’s parliamentary elections, slated for October 20. Briefing the UN Security Council, he said the world body was aware of real fraud that could take place, as well as allegations of fraud which might have the tactical purpose of discrediting already difficult elections. The elections would be a test for Afghanistan’s nascent democratic institutions, he said, adding the Independent Election Commission was expected to perform with integrity and accountability to the Afghan people. Almost a third of 7,000 polling centers could not open due to insecurity, raising concerns about inclusivity of the democratic exercise, the top UN diplomat said. UNAMA would do everything possible within its mandate and with the resources available to support a successful electoral process in the country, he promised. President Ashraf Ghani’s offer to the Taliban to engage in talks without preconditions had created unprecedented political space for peace, culminating in the temporary ceasefire in June, he said. He believed all actors recognized the craving of the Afghan people for peace and the undeniable need for a peace process. “We are in a better position now than at any time in the past 17 years to commence the process which would lead to talks for a negotiated end to the conflict. “It will require resilience and persistence by all sides. 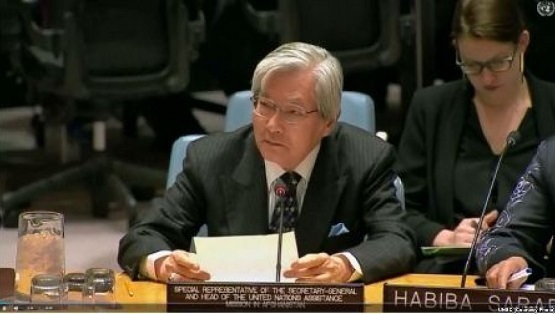 The efforts of the Afghan government, which we hope would be reciprocated by the Taliban,” the UNAMA chief remarked. Yamamoto urged all sides to agree on concrete measures to build confidence towards more structured talks. He suggested prisoner releases and improvement in agriculture, education and health sectors. “It is a time for important decisions in Afghanistan. These decisions will affect the fundamental fabric of the society and future of Afghanistan”, he added, referring to the parliamentary elections slated for 20 October – the first time since 2010 – and the 28 November ministerial conference in Geneva, co-chaired by the Afghan Government and the UN.